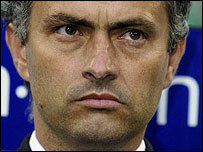 Chelsea boss Jose Mourinho has won the Barclays manager of the year award for winning his second Premiership title. Mourinho was given the award by the Barclays Award Panel, which includes representatives from football's governing bodies, the media and fans. "It is a big honour, the consequence of Chelsea being champions, but it is a surprise as in the season I didn't win one manager of the month," he said. "It is a collective award, it's about manager and team achieving the target." He added: "At the same time I don't forget the other people who also had very positive work and one of them could have been the winner. "Mark Hughes did it with Blackburn by reaching the Uefa Cup, Alan Pardew and Paul Jewell did it at West Ham and Wigan by having a very stable season. "Of course Man United, Liverpool and Arsenal wanted to be champions and they weren't." Matt Appleby, from the panel, said: "Chelsea have yet again been the dominant force this season. "Mourinho proved he is one of the most tactically astute managers around." Chelsea finished the season eight points clear of second-placed Manchester United despite losing their final two games of the campaign. The Blues had clinched the title by beating United 3-0 at Stamford Bridge on 29 April. Only United have managed Chelsea's feat in winning back-to-back titles since the formation of the Premiership in 1992.